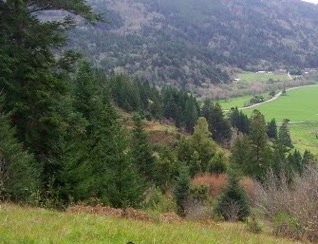 THPBlog: Green Diamond Resource Company to clearcut log SE of Smith River, CA. Green Diamond Resource Company to clearcut log SE of Smith River, CA. This THP is 2 miles SE of Smith River, CA and Highway 101 at an elevation of 100 to 1,400 feet. Green Diamond Resource Company is planning a mostly clearcut tractor and cable logging operation on steep and unstable slopes in redwood, Douglas fir and western hemlock forests. There are shallow rapid landslides in units A, B, C, D, E, F and H, deep seated landslides in unit F, and steep stream side slopes exceeding 65% grade in units A and B. 41 road drainage sites are planned for work including rocking, dip construction, ditch cleaning, culvert repair/replacement and restoration of washed out crossings. Tailed frogs are known to occur immediately adjacent to unit E, and there is a historic (1974) bald eagle nest .4 miles north of unit J. Foothill yellow legged frogs were reported in Rowdy Creek, and also 1,700 feet downstream from unit H. Spotted owl nesting territories occur within .25 miles of units A and E, and within .5 miles of unit F.